This scenario is not fictitious. It is a reality for many of the 370 million people worldwide who identify as Indigenous Peoples. If there could be a simple way to define them, we can agree that they are the living descendants of the pre-colonized inhabitants of lands now dominated by others. It was only 10 years ago, when Indigenous Peoples around the globe achieved the most substantial victory in a century of demands: the United Nations Declaration on the Rights of Indigenous Peoples (UNDRIP). The adoption of this declaration has been a breaking point, given the fact that 144 countries reaffirmed that Indigenous Peoples are entitled without discrimination to all human rights recognized in international law. Since 2007, the UNDRIP has guided global efforts to overcome and repair the historical denial of their most fundamental rights, including the most basic right to self-determination. UNDRIP brought the concept of collective rights to the table. This means that as a group, Indigenous Peoples possess rights that are indispensable for their existence, well-being and integral development as a distinct society. This is perhaps the reason why many find it difficult to relate to their struggles, since dominant societies base policy making and development actions on the protection of individual rights, such as the right to property or privacy. Representing 5 percent of the world’s population, today many Indigenous Peoples are still excluded from society and deprived of their rights as equal citizens of a state. Living in 70 countries and speaking more than 4,000 native languages, they have gained increasing visibility for raising their voices on aggressive development policies that threaten the world’s remaining ecosystems and the biodiversity that depends on them. As the world moves fast to explore and exploit these ecosystems to meet increasing consumption, Indigenous Peoples are at the top list of those murdered for defending their land. Almost 130 environmental activists have been killed so far in 2017. Another four are expected to be killed in the next week. This global trend is not a coincidence. Indigenous territories are the richest in biodiversity and today more than ever they are becoming the new battleground for human rights and the environment. “Even though violence against Indigenous Peoples is increasing, the Declaration should be celebrated. Without this Declaration, Indigenous Peoples wouldn’t have a chance to fight”, describes Julie Koch, Director of International Work Group for Indigenous Affairs (IWGIA). The main driving force for the global assault on indigenous land is that state governments have largely failed to establish constitutional rights and protections for Indigenous Peoples. UNDRIP provides states with a legal framework to establish these rights and protections. The increasing rates of criminalization of indigenous leaders and the murder of environmental defenders shows us just how much work states have to do for the Indigenous Peoples of the world. It is also a strong reminder that the world’s Indigenous Peoples are key to saving our planet. The global trend of attacks on Indigenous Peoples takes different shapes on different continents. Let’s go through some of it. Even though Latin America has a favourable legal framework to rely on, it is often reported as the most dangerous continent for environmentalists. Many of the reported killings were of people trying to combat illegal logging in the Amazon. It only takes a quick look into Brazil to understand what the fight is all about. Here is where the highest number of environmental defenders have died on Earth. Since 2013, 900 indigenous leaders have been killed for defending their lands, despite legally owning 12.2 percent of the country’s territory and living peacefully in 704 collective territories. Another eye-opening case is Venezuela, where actually the land demarcation process has only met 13 percent of the cases in the last 17 years, neglecting the urgent call to action stated in the Constitution. Just to make things more complicated, the government recently approved the creation of the AMO (Orinoco Mining Arc) region, a mega mining project that will give 150 companies from 35 countries access to 12 percent of the national territory. Once again, national policies seem to forget how illegal mining has already driven aggressions and threats towards the Yabarana, Hoti and Panare peoples close to the border with Brazil. Mega-nature reserve? Or mega-mining frontier? The race for water is also affecting Guatemala, where hydroelectric projects are quickly on the rise. Groundwater recharge areas are located on indigenous land and indigenous communities have constantly denounced the theft of river water. Various companies and private landowners illegally divert rivers to sugar cane, banana and palm oil plantations and cattle ranches during dry seasons. Surprisingly, Bolivia does not escape from this pattern. With a controversial political decision, Evo Morales gave the green light to construct a highway on indigenous land. This development project has for several years been opposed by environmentalists and the indigenous movement since it cuts through Isiboro Sécure National Park and Indigenous Territory (well-known as TIPNIS). The construction of this highway is part of a bigger plan. The highway aims to extend the existing Brazilian-led effort commonly known as IIRSA (Initiative for the Regional Integration of South America). This entails a network of 531 mega-projects that include hydroelectric dams, highways, bridges, and electrical power systems that seek to ease the flow of transportation of soybeans and coca across the region. But the impacts are not only economic. The highway will considerably affect the traditional way of life of three indigenous groups: the Tsimanes, Yuracarés and Mojeño-Trinitarios. But the fight back seems promising. 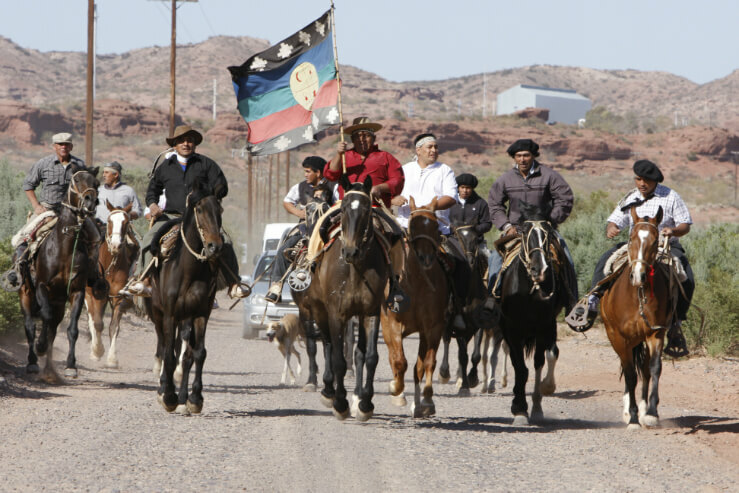 Indigenous autonomous governments are representing much more than a trend in the region. Self-governance is one of the most significant claims made by Indigenous Peoples in this part of the world and it seems to be on its peak of realization with the two first indigenous governments settled in Peru and Bolivia. 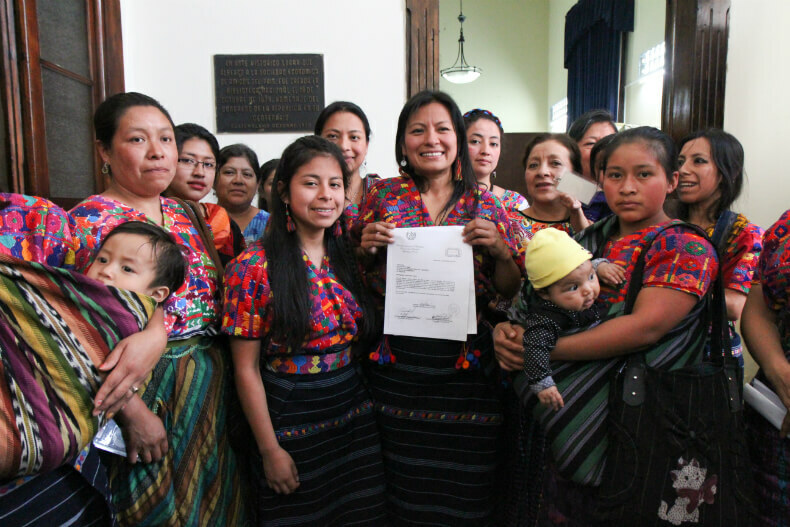 The Wampís Nation’s Parliament and the Charagua government took office last year and made their goals clear: they aim to control how to administer the future of their ways of life within the territory they inhabit. Asia is home to 260 million Indigenous Peoples, making it the most culturally diverse region in the world. The land dispute pattern in this region is significantly worse due to heavy assimilation pressure and violent repression by state security forces. As Indigenous Peoples in other countries, they face the routine denial of self-determination, loss of control over their land and extreme discrimination. 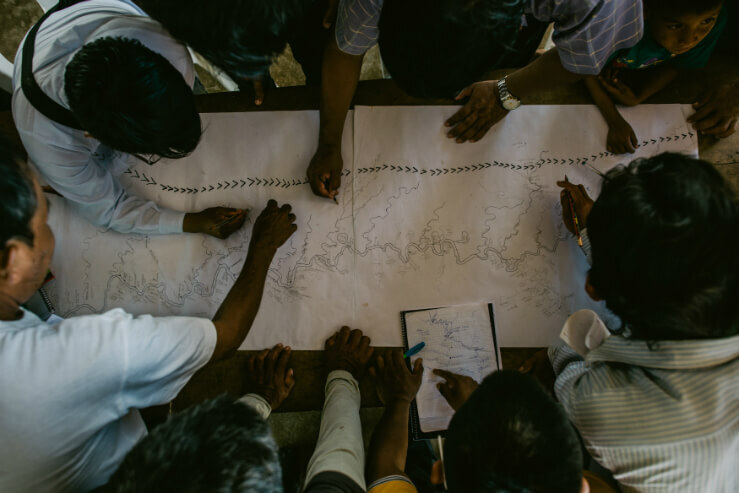 One of the most clear examples of the lack of respect for indigenous land rights is the conflict in the Chittagong Hill Tracts (CHT) region in Bangladesh, where approximately 600,000 Indigenous Peoples live. Ever since the creation of Bangladesh, the elected representatives of the CHT have demanded regional autonomy. Being trapped between demilitarization and displacement, gross human rights have been committed and documented over the last 10 years. The most affected by the conflict are indigenous women. Being under the review of the UN Convention on the Elimination of all Forms of Discrimination Against Women (CEDAW), several reports highlight cases of gender-based violence against indigenous women connected with land grabbing. Indigenous Peoples and minority populations in the Philippines are also hit by militarization. The “war on drugs” and the fight against Maoist rebels now led by President Duterte has led to many political extrajudicial killings in their communities. Indigenous Peoples are also cornered by the aggressive expansion of monocrop plantations, especially oil palm plantations in Mindanao. Community members from the municipalities of Bataraza and Española in Palawan have reported how their rights had been violated by several companies that continue to expand on community lands with the complicity of government officials. The situation in Nepal follows the course of aggressive development. During 2016, many protests against road expansion and electricity transmission lines intensified. The common picture that local indigenous communities paint is that bulldozers enter their land to ensure infrastructure developments go according the plan. Perhaps the most illustrative situation of discrimination comes from Japan. The huge gap in public awareness shows the long lasting effects of systematic discrimination. A national survey released by the government in 2016 showed that 72.1 percent of Ainu people agreed that “discrimination against the Ainu people exist”, meanwhile 50.7 percent of the general public stated that “discrimination does not exist”. Laws protecting Indigenous Peoples are weak or nonexistent throughout continental Africa. With very little political support and space for critical NGOs and media that can effectively report on human rights violations, conservationist and agribusiness agendas frequently push Indigenous Peoples from their homelands. In Loliondo village in Tanzania, indigenous communities suffer from a systematic attack that aims to reduce their number of livestock, which is vital for their survival. Increasing tensions and clashes with farmers and ranchers are usually driven by recurrent drought. Another common tactic used by the military is to burn houses, which speeds up illegal evictions. Just last month, Serengeti National Park and Ngorongoro Conservation Area Authority rangers, with the support of Loliondo police, burned down about 185 Maasai bomas (homesteads). The evictions left approximately 6,800 people homeless, with most of their property destroyed. Evictions are also a current challenge for Indigenous Peoples in Kenya, where the definition of community lands is not in place to allow the urgent need to formalize land ownership. Earlier this year, drought caused traditional herdsmen to steal pasture from landowners, burning down tourist lodges and grabbing the attention of the world media in the process. Laikipia, meanwhile, has experienced unprecedented grazing pressure and the Maasai have been forced to endure limited access to water. This is not the first time that climate shock has systematically triggered violence over land rights in Northern Kenya. The chain of events is pretty straightforward: when there is no water, no grass grows and pastoralists’ cattle starve to death. The other side of the coin is that Indigenous Peoples are gaining recognition in the courts. Against all odds, we saw an historic land ruling in Kenya this year in the hands of the Ogiek. The African Court on Human and Peoples’ Rights set a vital precedent, recognizing that as Indigenous Peoples the Ogiek have the right to reparations from the Kenyan government for the suffering they have endured from forced evictions. If Indigenous Peoples remain unprotected, it will continue to have a direct impact on the shape of our planet and its capacity to sustain life. Many would think this gap has nothing to do with protecting the environment, but it absolutely does. The fight for indigenous land rights is not just about rights, but about securing a sustainable future for everyone. If states and corporations fail to protect those who are putting their lives on the line to defend the diversity we depend on, it may only be a matter of time before resource scarcity leads them to turn on everyone else. Indigenous Peoples have pursued environmental justice since long before climate change became a mainstream issue. Ten years after their biggest victory, it is time we take indigenous land rights seriously to ensure we all continue to have water to drink, air to breathe, and even land to call home.